The theme of the installation was the ancient game of Hyakumonogatari Kaidankai (A Gathering of 100 Ghostly Tales) which was first played by samurai as a test of courage. The players would sit in a room and, as night fell, light one hundred candles. Each person in turn would then tell a kaidan and blow out one of the candles when finished. Thus, as the evening progressed, the room would get darker and darker. The extinguishing of the final candle was believed to summon a supernatural entity. Yotsuya Kaidan, originally written by Tsuruya Nanboku IV in 1825 as a kabuki play, is arguably the most famous Japanese ghost story of all time. More than 30 movies have been based on it and this story continues to have an influence on Japanese horror films today. The inspiration for Nanboku’s famous story were two real-life murders of the time: the first involved two servants, who killed their respective masters and were caught and executed the same day; the second concerned a samurai who, discovering his concubine was having an affair with a servant, nailed them both to a wooden board and threw them in the Kanda river. 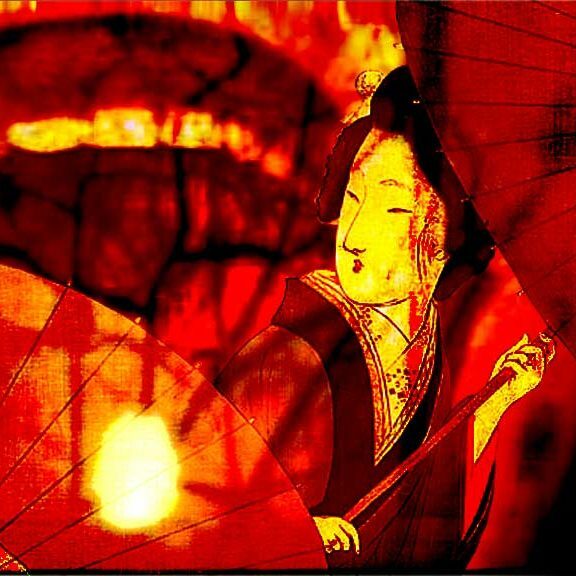 Format: Series of seven site-specific video installations, custom built bamboo projection screens, illuminated hanging masks, with multiple soundtracks.